EZstrip™ is a family of products, patented and manufactured by NOV Mono. Launched in 2009, EZstrip™ has revolutionised the way in which progressing cavity pumps and associated products are maintained. The main feature of the EZstrip™ is the ability to ‘Maintain-In-Place’ (MIP), making a day-long maintenance operation of a PC pump into a 30 minute job. 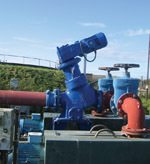 The sludge pump can be completely stripped down and re-built in just 15 minutes, without the need to disconnect or remove any pipe work. The sludge pump features a specifically designed feed chamber that is disconnected by removing only a few screws and allows access to the pin joint area for removal of any blockages or compressed cake. Once the rotor assembly is disconnected from the screw conveyor, the rotor and stator can be removed – all in just six minutes – remarkable by any standards! The EZstrip™ cake pump is designed with a large auger inlet and screw conveyor. Read more. The new API 676 EZstrip™ pumps provide a practical, reliable and proven solution for many types of oil, gas and mud handling duties in drilling, exploration, production, processing and separation operations. The new pumps feature a long-coupled, full-size base frame design that incorporates a drip tray in accordance with the API 676 Third edition and also Mono's EZstrip technology which provides a quick and easy way to disassemble and fully maintain them in-situ. Read More. Following on from the successful launch of the EZstrip™ Progressing Cavity (PC) pump range, NOV Mono® has incorporated the same MIP technology into its range of mine dewatering systems, providing world class innovation for its mining customers. Read more.